Air Factory is a candy and fruit flavored vape juice line that would satisfy any vapers sweet tooth craving. The flavor of this candy flavored e-juice line is suppose to taste just like those delicious air head candies and we have to admit, it is hard to tell the difference! 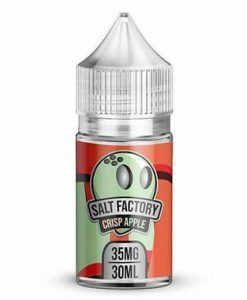 If you like a little sour and sweet in your e-juice then, this is the perfect vape flavor for you. Air Factory just released a new dessert vape juice line, Treat Factory. Prepare to be in for one delectable treat when you pick up any of the two flavors from Treat Factory. One is a cookie flavor and the other is a watermelon flavor that will leave your mouth watering. You can’t go wrong picking up any of Air Factory or Treat Factory vape juice flavors!